The Selwyn Hotel, South Promenade, St.Annes-on-the-Sea. The Selwyn Hotel, 35, South Promenade, was in the stone-fronted block of houses on the corner of Eastbank Road; two other hotels in the block were "The Melrose" and "The Grove". In the 1990s The Selwyn Hotel changed its name to "The Sandpiper". This block of hotels was demolished about 2005 and the site is empty. 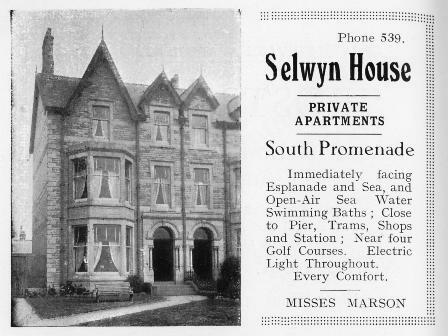 The Selwyn Hotel, South Promenade, St.Annes-on-the-Sea, an advert from 1925.